Everywhere you go in the U.S. people love barbecue, but some regions have become known for their distinct flavor of BBQ. The Carolinas and Texas styles of barbecue are probably what comes to mind when you think BBQ, but Maryland has also made a name for itself in the world of barbecue. In Maryland, in particular Baltimore, the barbecue of choice is pit beef which basically is barbecued beef that is crusty on the outside and juicy and almost rare on the inside. The meat is shaved into thin strips and heaped high on a sandwich. People come far and wide for a Baltimore pit beef sandwich. Most of the time top round is used instead of brisket which is the favorite in a lot of the other styles. Maryland BBQ has a distinctive flavor that you can’t get anywhere else. The bread also adds to the tastiness of the sandwich. Pit Beef is served on a Kaiser Roll or rye bread which give an earthy flavor to the sandwich. What else makes this such a signature Maryland BBQ dish is the sauce. Unlike other regions which use a mix of ketchup, brown sugar or vinegar to give the meat its flavor, the sauce used with Maryland pit beef has horseradish sauce in it which keeps the customers coming back for more. No one is exactly sure how the Maryland pit beef phenomenon started, but anecdotal history says that pit beef first started to show up in Baltimore’s working-class neighborhoods in the 1970s, especially along Pulaski Highway. 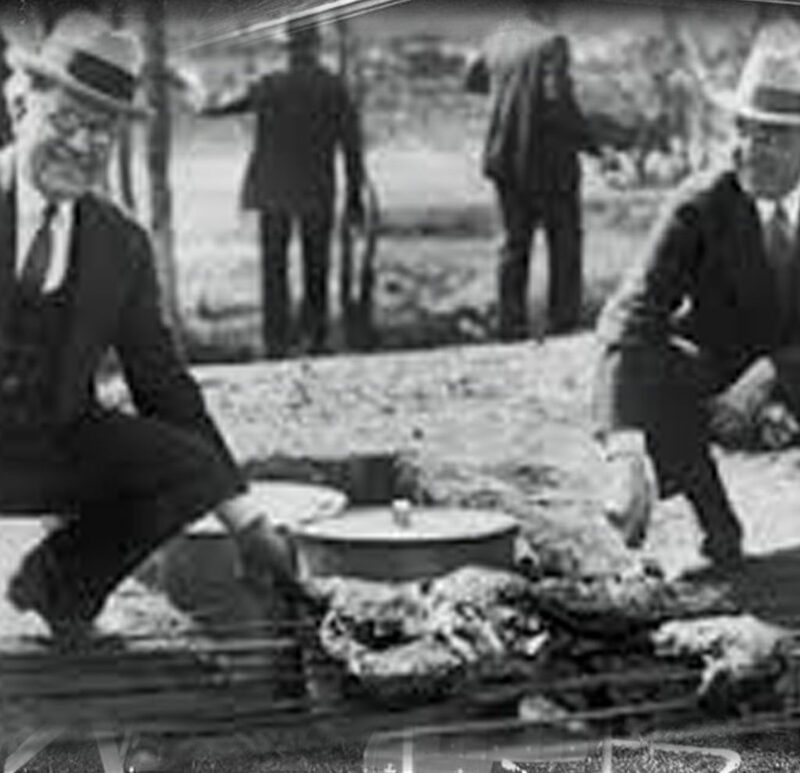 First they were roadside stands and trailers and then some of them developed into full-fledge restaurants. Pit cooking was made for this type of set up because it simply involves grilled beef over a bed of hot charcoal. For the longest time, the wonders of Baltimore pit beef were shared mostly by word of mouth as Baltimore natives raved about their favorite pit beef joint and soon people were traveling from different parts of Maryland and even from out-of-state to get a taste as well. It wasn’t until the 1990s though that pit beef became a strong piece of Baltimore’s identity just like blue crabs and you started to hear and see food and travel writers talking about Baltimore pit beef more and more. Boog Powell, former first baseman for the Baltimore Orioles, also brought attention to pit beef with his food, stand Boog’s Corner, now Boog’s BBQ, in Oriole Park at Camden Yards, when it just opened. 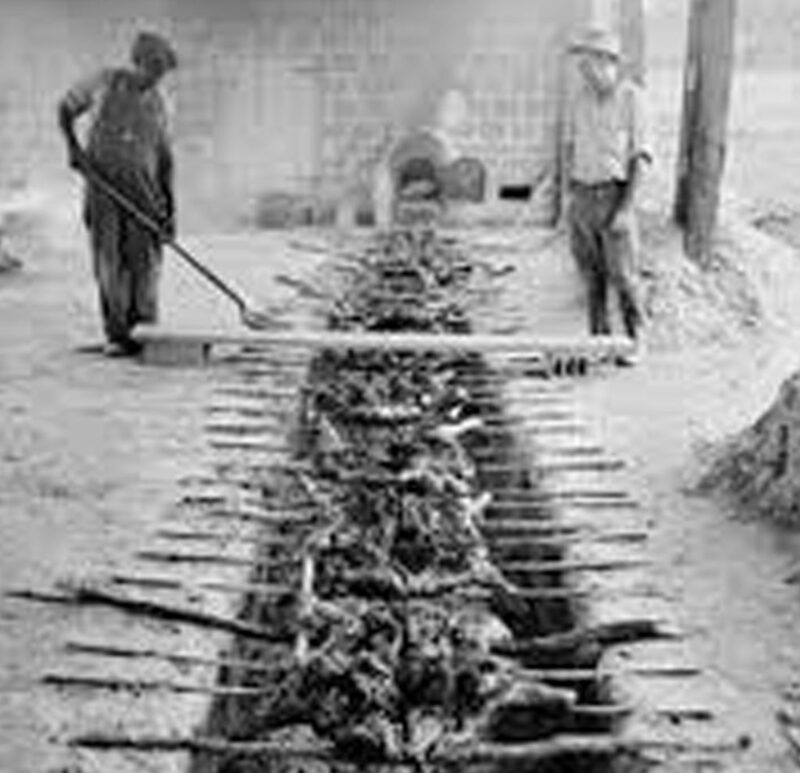 As pit beef started to get more national attention, some barbecue enthusiasts questioned whether the method of cooking pit beef should truly be called BBQ because some places cook it on a grill using gas and it is technically not slow cooked. But that hasn’t stopped the love for pit beef from spreading. It is all about the taste. 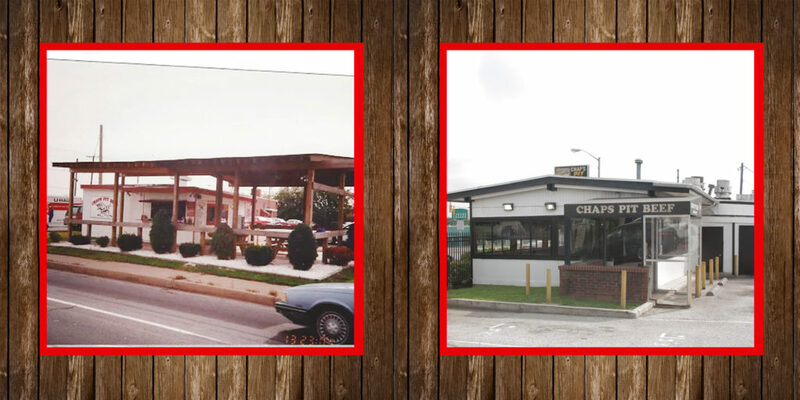 Chaps Pit Beef is one of the pioneers of modern day Maryland pit beef. With locations in Baltimore on Pulaski Highway and in Aberdeen on Beards Hill Road, they have created a strong following of patrons and restaurant critics alike. 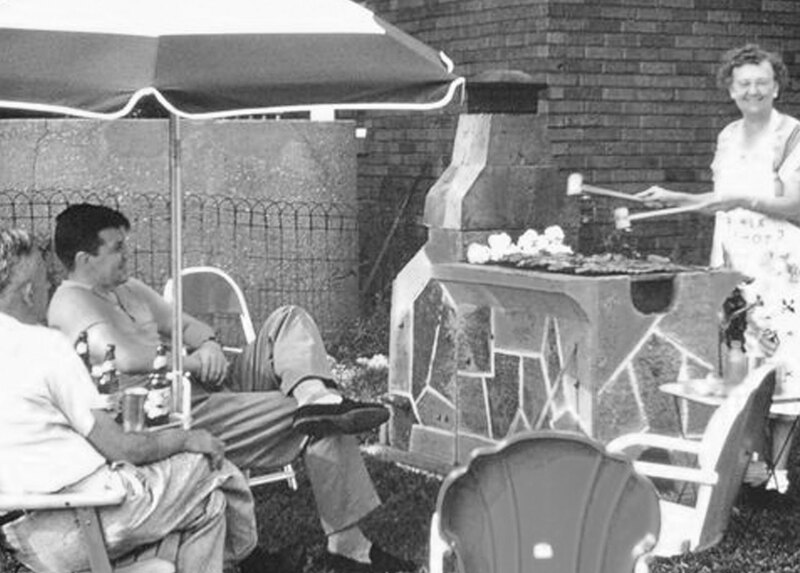 Chaps “Baltimore Style BBQ” method is what made their original pit beef sandwich so famous. To make a Classic Pit Beef sandwich, Bob uses a bottom round roast flat cut from the hind quarters which are a tougher, but more flavorful cut. He trims the gristle and silver off the meat and then applies a dry rub of different herbs and spices like paprika, salt and pepper, thyme and onion powder. He then lets it sit overnight and in the morning he puts it on an open pit of burning hardwood charcoal that gets to gets to about 400 to 500 degrees. Do You Love Pit Beef? 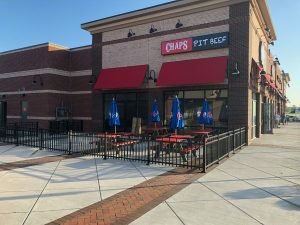 Chaps is also looking to expand its franchise program even more so they can bring their own personal brand of Maryland BBQ to more people. 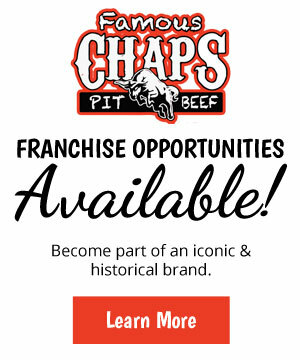 If you are a meat lover looking to get into the barbecue franchise business, consider becoming a franchisee of Chaps Pit Beef. If you have always wanted to be your own boss, a barbecue franchise is a smart choice because barbecue will never go out of style. What could be better than surrounding yourself with the food you love all day long? Contact Chaps Pit Beef today for more information about barbecue franchising.